It has been a while since a book so grabbed my attention like this one has. It has instantly become one of my favorite book club reads, right up there with The Red Tent, The Samurai's Garden and a few others. The character of Rahab was written so well that it is easy to see how she rose above her circumstances to make a difference in the lives of others. Forced into a life she did not choose by parents who felt they had no other option other than to sell her, she chooses her own terms and makes a life for herself. Over the course of years, she builds a successful career and has an inn type house. She then follows her heart, finds God and has a chance to start fresh. I LOVE this book!!! I plan to read another Tessa Afshar book very soon. Edition Reviewed: Kindle eBook - I purchased my copy of the Kindle eBook as it is our current book club book. Can a Canaanite harlot who has made her livelihood by looking desirable to men make a fitting wife for one of the leaders of Israel? Shockingly, the Bible's answer is yes. Pearl in the Sand tells Rahab's untold story. Rahab lives in a wall; her house is built into the defensive walls of the City of Jericho. Other walls surround her as well--walls of fear, rejection, and unworthiness. A woman with a wrecked past; a man of success, of faith...of pride. A marriage only God would conceive! Through the heartaches of a stormy relationship, Rahab and Salmone learn the true source of one another's worth and find healing in God. 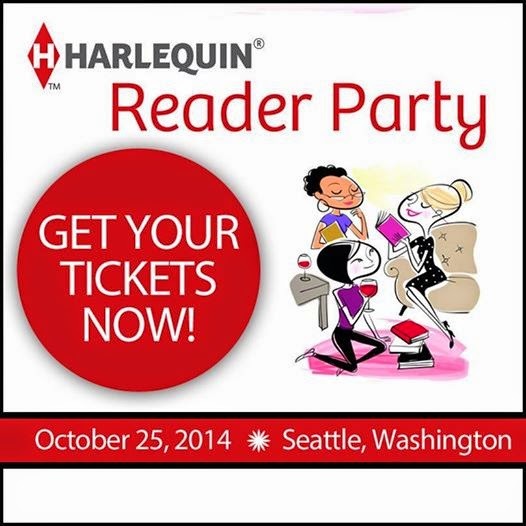 If you will be in or around Seattle on October 25th, 2014 I hope you will join me at the Harlequin Reader Party! It sounds like it will be a lot of fun. I bought 2 VIP tickets (one for me, one for Mom so we can make it a "girls day out" kind of day), which means that we get to have exclusive seats at Sheila Roberts' lunch table (there are 12 Harlequin authors, 8 seats per table). At the start, I believe each of the authors are going to visit each table in a sort of like speed dating. We can chat, ask questions, etc. Then our author will join us for lunch, which I think is followed by a book signing (free books for VIP ticket holders).